or: The fantastic dud of the trilogy. Why do I hail Toy Story 2 as the fantastic 'dud' of the trilogy? Well, while it is still very, very good, I didn't find it as charming as the first one, or as (insert amazing description here) as the third one. But don't worry, there was no way I was going to hate Toy Story 2, as it makes up what may be the greatest trilogy of all time. It still has everything the first one has, but suffers from the sometimes inescapable second-movie syndrome. While Andy is away at summer camp Woody (Tom Hanks) has been toynapped by Al McWiggin (Wayne Knight), a greedy collector and proprietor of Al's Toy Barn. 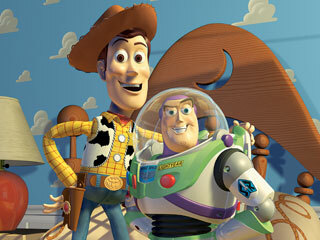 In this all-out rescue mission, Buzz (Tim Allen) and his friends Mr. Potato Head (Don Rickles), Slinky Dog (Jim Varney), Rex (Wallace Shawn) and Hamm (John Ratzenberger) springs into action to rescue Woody from winding up as a museum piece. They must find a way to save him before he gets sold in Japan forever and they'll never see him again! I was so happy when I found that Toy Story 2 has the same formula as it's predecessor, and uses all the tricks in the bag to make us really root for these characters. In most sequels, they will always try to overblow the franchise and get more than they did for the first one. It's like reinvesting money just to get some more interest, but most of the time that investment gets lost in the mail or the finance company goes bankrupt. That's not the case with Toy Story 2. It's a wonderous sequel, and really holds its own in the trilogy. Come to think of it, the trilogy really holds it's own among every other film. They all have that warmth and honest emotion we never see in a kids movie; also a message which isn't thrusted in front of our faces, but is put in there with such subtlety that we can't help but love the movie. Again, the computer graphics are amazing, and this is really the benchmark of animated cinema. Sure, the 2D sketch animations by Disney were great, but Toy Story 2 ensures that we all like Pixar's computer generated animation. And we do. Film doesn't really get much better than this. However, if I have one thing to say about this fluffy sequel, it's that this get's a bit too melodramatic, and doesn't have the same happy/emotional edge that the first one had. But given that minor issue, the rest of the film is enjoyable, well composed, and definitely one of the best examples of why Pixar makes the best movies. Yes, they're even better then the live action ones. THE VERDICT: A great sequel, with all the charms that one could expect from a Toy Story movie. Of all my kids toys, her woody doll is her favorite. She just can't get enough with it, we've seen the movie for more than 5 times. Disney is so generous to create toy story.